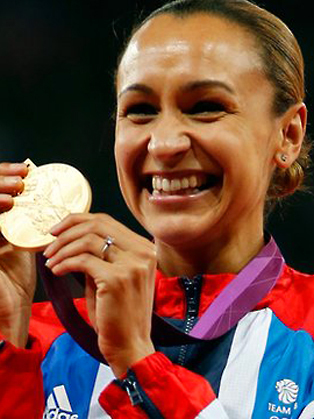 Jessica Ennis-Hill, CBE is a retired English and British track and field athlete specialising in, multi-eventing disciplines and 100 metres hurdles. A member of the City of Sheffield Athletic Club, she is the current Olympic heptathlon champion. She is the current British national record holder for the heptathlon, the indoor pentathlon, the high jump and the 100 metres hurdles. She is also the former European and world heptathlon champion and the former world indoor pentathlon champion. Jessica competed at the 2003 World Youth Championships in Sherbrooke, Quebec, Canada in July and the 2004 World Junior Championships in Grosseto, Italy, but it was her winning performance at the 2005 European Athletics Junior Championships in Kaunas, Lithuania that brought her to the fore. Her first senior championships was the 2005 Universiade, held in Turkey, where she won the bronze medal with a new personal best of 5,910 points. One of Jessica's first victories as a senior came in February 2004, when she was eighteen years old. She won the 60 metre hurdles at the Northern Senior Indoor Championships in a time of 8.60 seconds. Two weeks earlier she had won three Northern Junior Indoor Championship titles: the 60 metre sprint, the 60 metre hurdles and the high jump. In her first outdoor competition of 2009, Jessica broke her personal best, scoring 6,587 points to win by 510 points in Desenzano del Garda. This was a fantastic performance after she was forced to miss the Olympic Games in Beijing with a stress fracture in her ankle. She finished off the event with a personal best in the 800m of 2 minutes 9.88 seconds. This performance moved her to third on the UK all-time lists of heptathletes, with a score only bettered by former Olympic and Commonwealth champion, Denise Lewis (6,831 points), and former Commonwealth champion, Judy Simpson (6,623 points). Jessica went into the 2009 World Championships in Berlin as a resounding favourite, the only British athlete to go into their event as the number one in the world that year. The pressure of being the bookie's favourite to win didn't affect her performance. Jessica duly delivered the goods, leading from the first event through to the last and recording a life-time best of 6,731 points, exactly 100 points behind Denise Lewis' UK record, which is surely on borrowed time. Her first day score has only been bettered by Jackie Joyner-Kersee and Carolina Kluft, the two top performing women heptathletes of all time. In total, over the season she recorded six personal bests in 100m, 800m, 100m hurdles, long jump, shot and javelin. Jessica won the Olympic heptathlon gold medal at London Olympic 2012, the first for Britain on the track at the London Games. On her way to the gold medal she scored 6,955 points, that is her personal best career points as well as national record. She came 1st in 100m Hurdles, 200m and 800m Race. She came 2nd in Long Jump, 5th in High Jump, 9th in Shot Put, 10th in Javelin. Jessica is a patron of the Sheffield Children's Hospital charity and of businessman Barrie Wells's sports foundation. She is also an Ambassador for the Jaguar Academy of Sport. She writes a column for The Times newspaper. In October 2016 Jessica announced her retirement from athletics. In the 2017 New Years Honours, Jessica was made a Dame for her services to athletics.